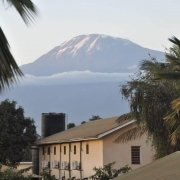 Mt Kilimanjaro stands in isolation and dominates the horizon near Moshi in Tanzania with its snow-capped peak pressing high into blue sky. The desire to discover its majestic beauty drives more than 40,000 people every year to climb 5895 metres to the roof of the African continent. It is a beacon that represents freedom to the people of Tanzania and nurtures an economy that is fuelled by the desire of men and women to summit the highest freestanding mountain in the world. Mt Kilimanjaro delivers physical and emotional challenges in an environment of beauty. It rises from coastal scrubland and with every step gives its climbers an adventurous experience that includes lush montane forest, heather studded with giant lobelias, the chance to sight elephant, leopard, buffalo and primates during the ascent into an alpine desert of ice and snow that leads to the summit, Uhuru Peak. The drive to summit Mt Kilimanjaro is individual but the Peak Potential Adventures team has learned of numerous reasons why people climb as they have guided its family of clients to Uhuru Peak. We want to reveal the experience of Mt Kilimanjaro to you and believe the stories of our climbers will inspire you to say ‘yes’ to an adventure with us. We are proud to begin with Russ Holland. Take a moment to watch the video, ‘Defining Moment’ to gain an insight into the power of the Mt Kilimanjaro experience. 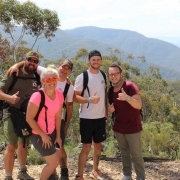 Peak Potential Adventures runs the Mt Kilimanjaro Charity Challenge to raise money for Make-A-Wish Australia to assist it to grant the wishes of seriously ill children. It is vital support and it is what compels many people to successfully summit Mt Kilimanjaro. So far we have given $108,000 and look forward to donating a great deal more in the coming years. The strongest motivator for the journey to Mt Kilimanjaro is that it inspires life changes and transformation. 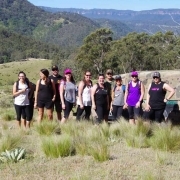 The choice to say ‘yes’ to the climb is a catalyst and it delivers experiences that enlivens people. However, there are many other motivators for climbing Mt Kilimanjaro; fundraising, the need to mark a personal milestone such as graduation, retirement, marriage or divorce, and to celebrate and commemorate a life. In 2014 Peak Potential Adventures team member, Luke spread the ashes of his good friend, Scotty, who died on the summit in April 2009. Luke and Scotty’s story will also be one that we will share with you in the coming months. The summit of Mt Kilimanjaro is a place for reflection, inspiration, and potentially a new beginning in life. Generally, people see the world in a different way after the experience. The famous saying by David McCullough Jr. is one we like to apply to the experience of climbing Mt Kilimanjaro. The beauty of Mt Kilimanjaro is revealed to so many people each year because technically, it is one of the easiest of the Seven Summits to climb and is considered a trek more than a mountain climb. You don’t need ropes or technical climbing gear on Mt Kilimanjaro, which makes the climb accessible to anyone with little or no mountaineering experience. However, it is important to note that the easy accessibility of Mt Kilimanjaro also makes it dangerous. On average there are around 10 deaths on the mountain each year and of the 40,000 people who climb, only about 60 per cent make it to Uhuru Peak. Significantly, 100 per cent of Peak Potential Adventures climbers have stood at Uhuru Peak to experience the euphoria of summiting the mountain. Mt Kilimanjaro will challenge you physically and mentally but the adventure will reward you with memories and experiences that will transform your perception of life. I can see a new tomorrow. So what are you waiting for? Say ‘yes’ to Mt Kilimanjaro and become part of our family of climbers. Everest Base Camp - Age is no Excuse!